Summer is officially here in the South, got up to 100 F yesterday, whew! With the humidity really kicking, I mean so thick you can almost cut it with a knife, the Temperature feels more like 110, and that’s sitting in the shade! We did have some clouds roll in and serious thunder, but only a few small drops of rain as it passed on by. This morning I came out around 9ish, and while not as hot, the humidity is still thick. Start to break a little sweat within minutes. As I sat down to begin, a black snake comes strolling right on up right at my feet. I sat up, it saw me, and took off by the pool where I snapped a pic right before grabbing him. He’s now resting in my pool net…lol! 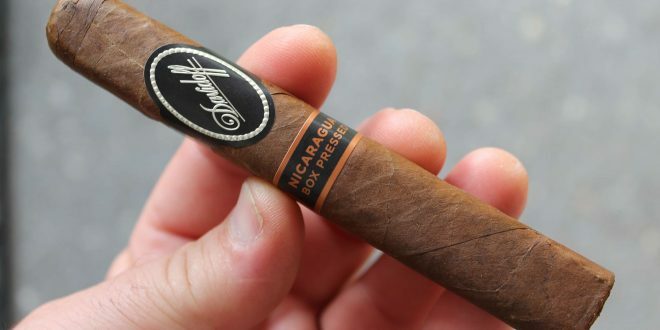 I brought out a fresh brewed cup of coffee, and grabbed a Davidoff Box Press Robusto to try. Arriving in the mailbox with these hot temps, I let it rest for quite a few days before trying it. I really like the five finger box these come in, the colors are really good of black and dark orange. I also enjoy a box press, just like the feel of it in the hand. 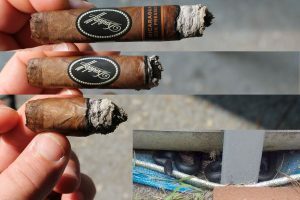 The cigar is chocolate brow with minimal veins, has a good weight, and slight give when I squeeze it. After clipping the cap with my small knife (still need to pick up a cutter), I find the draw is perfect with taste of straightforward tobacco. I toast the foot, get whiffs of the beginning smoke, and it is really good. I mean, really good. After a few puffs to get the fire going, I take a draw and find this thing produces a huge amount of smoke with very little effort. I let the smoke escape slowly, which is cool and very smooth over the palate. My initial thought is it has an herbal quality in the flavor with notes of a citrus fruit. Loads, and I mean loads of woodiness is left as I smack my tongue, some leather comes through as well. Now, I told Cory over at Famous (great guy by the way) that I really enjoyed a full strength/full bodied cigar. Well, he certainly didn’t disappoint with this one as it is definitely both, and I am thoroughly enjoying it! The draw is spot on producing huge plumes of smoke with each draw. 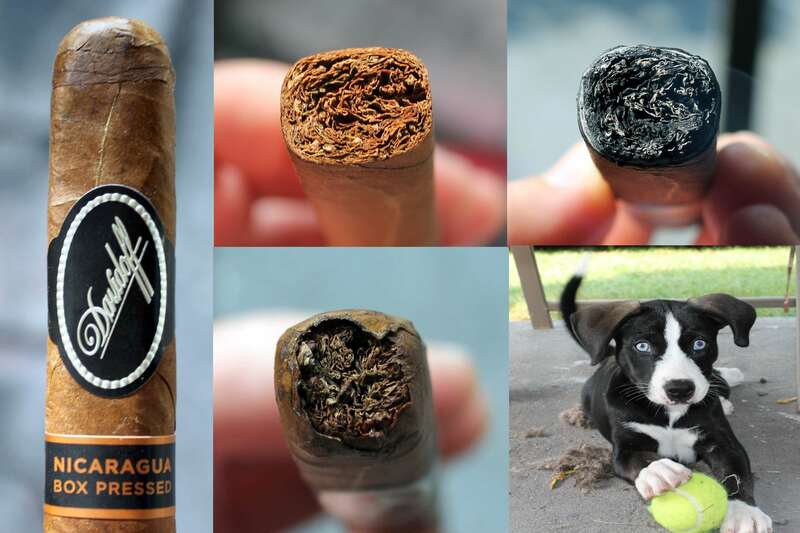 It has a perfect burn with a very light gray colored ash forming that holds well for a little over an inch before falling off. There’s hardly any coning, which is a good sign of the well-aged tobaccos marrying together. Flavor, strength, body all are consistent as I head through the halfway mark, and I am really digging this smoke. It’s hitting my palate just right, but I will warn to be careful with letting too much escape through the nostrils. I did and made my eyes water up a bit…lol! I think of John Cougar Mellencamp’s song, “Hurt So Good”. My son, Greg Jr., moved in with me a few weeks ago as he and his girlfriend were having problems. First thing he does is ask if he can get a dog, which I haven’t really had one since my Mandy passed several years ago. Well, here he comes home one evening with a Lab/Husky mix puppy, and she’s beautiful with big blue eyes. As I sit here, she’s all over the place running and playing, and I have to say her personality reminds me a lot of Mandy. I’ve told my son oh well, she’s mine now. Ha! He’s not happy at all about it. Heading into the final stage of this smoke, I have to say it seemed to actually get better! 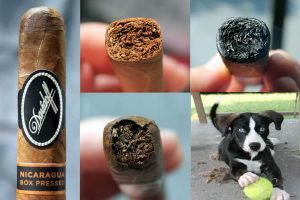 Some smokes will start to get hot and bitter towards the end, but this one seemed to take on a bit of sweetness like a dark brown sugar that I was really liking. I will say though, that the strength, which I didn’t think could be possible, kicked up a notch. I like it! This was one amazing cigar, hitting my palate perfectly in all aspects. It had a richness in the flavor I just couldn’t seem to get enough of, and the strength/body spot on. I would say with some serious downtime? This would be one incredible smoke!